The Ogallala Aquifer is a vast geologic formation that sprawls underneath parts of eight states from South Dakota to Texas. 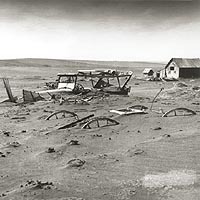 Early settlers in the semi-arid High Plains were plagued by crop failures due to cycles of drought, culminating in the disastrous Dust Bowl of the 1930s. After World War II, affordable technology became available to irrigate from the Ogallala. The High Plains was then transformed into one of the most agriculturally productive regions in the world. To say that the High Plains economy now "runs on water" is probably no exaggeration. Irrigated crops provide feed for livestock, which are in turn the primary inputs for local meat processing plants. Water is also essential for the livestock production and meat processing industries. The crop, livestock, and meat processing sectors form the core of the regional economy, accounting for a large share of employment and gross output. Because the Ogallala recharges very slowly, the High Plains economy is dependent on a finite resource. The fate of the High Plains has been a policy issue since depletion of the Ogallala became apparent in the 1970s. Policy makers have wrestled with how—and whether—to conserve the groundwater resource. This debate has recently returned to the fore at both state and federal levels. In 2001, Kansas formed a special citizens' committee to advise the governor and legislature on potential groundwater conservation policies (Ogallala Aquifer Management Advisory Committee, 2001). The renewed interest within the High Plains states partly reflects the recent drought and exhaustion of the aquifer's usable economic life in many areas (see Figure 1). The debate at the federal level has changed over time. Debates in the 1970s focused on conserving the Ogallala for national and international food security. During the 2002 farm bill debate, the focus shifted to the regional impacts of federal policies through their effects on water use. Because water is so fundamental to the region's livelihood, policies affecting water use ultimately change the scope and distribution of economic activity as well as the use of land and other natural resources. Federal policies affecting water use in the High Plains include commodity price programs, the Conservation Reserve Program, and cost-share programs for investments in new technologies. Central to policy debates is why water conservation should (or should not) be a policy priority. In this article we discuss three policy motivations for conservation: economic efficiency, equity, and moral duty. Policy debates are shaped by the relative importance of these motivations to diverse stakeholders. Reaching a consensus on these motivations is difficult. Nonetheless, policy tools flexible enough to address different concerns may best foster consensus-building. Economic efficiency means that resource use should yield the greatest net benefit to society. Allowing individuals to base their resource use on private benefits and costs heightens economic efficiency for many resources. Unfortunately, groundwater is an exception to this rule. Because of its common property attributes, the rate of groundwater use will likely exceed its most economically efficient rate. The inefficiency of unregulated groundwater use is easy to demonstrate. Because each user holds only the property right for pumping water, rather than the entire bundle of property rights for the water itself, withdrawals are governed by the "rule of capture." An individual pays only the pumping cost and not for the value of the water removed from the common pool. The private costs of pumping are therefore less than the social costs of withdrawing water. Excessive pumping is the result. Research has shown that common pool resources likely are overused if left unregulated. The more difficult question is how such resources should be governed for efficient use. In most High Plains states, groundwater use is governed jointly by state water laws and groundwater management districts (GMDs) controlled by local irrigators. Controls differ by state and district. In Kansas, New Mexico, and Colorado, the GMDs have adopted policies to deny new water permits if water availability in surrounding wells would be significantly reduced. In Texas, no such restrictions are possible under the state water laws; the Texas Supreme Court ruled that "the owner of the land is the absolute owner of the soil and percolating water" (Houston & T. C. Ry. Co. v. East). Whether the current combination of state and local rules has achieved efficiency for the Ogallala is an open question. The answer depends on the difference between social and private costs, or the external costs, of groundwater pumping. These costs are made up of three parts (Provencher & Burt, 1993; see box), all of which are hard to estimate. Because the horizontal flow of groundwater is very slow in the Ogallala (a crude average is about one foot per day), external costs are local in nature. At the same time, the flow rates of groundwater depend on different geologic factors. Many previous studies found low depletion costs in large aquifers such as the Ogallala, suggesting that economic efficiency could be nearly attained with unregulated pumping (e.g., Beattie, 1981; Gisser, 1983). More recent studies found potentially large risk costs and significant gains from groundwater management policies in arid regions (e.g., Tsur, 1990). Little or no evidence is available for the stock cost. Although efficiency-centered policies would satisfy the interests of private irrigators, such policies would not necessarily protect the public interest. An important part of the public interest is equity (or "fairness") in the distribution of water within and across generations of users. Equity within generations depends on water conservation because, despite the flatness of the High Plains, the bedrock floor of the aquifer is extremely uneven. Since most wells are drilled to reach bedrock, landowners above deep parts of the aquifer can reach water even when nearby shallow wells have become inoperative. If conservation maintains a high water table, then access to water will be distributed more equitably. Ensuring equity across generations, or sustainability, is defined as "meet[ing] the needs of the present without compromising the ability of future generations to meet their own needs" (World Commission on Environment and Development, 1987, p. 43). Sustainability requires attention to actions now that may change the stock of physical and natural capital in the future. For groundwater, sustainability depends largely on technological change. At one extreme, future generations could sustain their standard of living with little water by relying on technological improvements in crop varieties and irrigation systems. In the absence of new technologies, however, future well-being depends heavily on water conservation. Sustainability goals often conflict with private incentives. Intergenerational equity suggests that current and future benefits should receive equal weight in allocating a natural resource over time. Individual users, however, discount future benefits at their own costs of capital. Thus, sustainability policies must consider differences in social and private discount rates. Research can address the equity issue by evaluating the substitutability between water and technology. Improved irrigation systems may not reduce water use, particularly if irrigation runoff is recaptured and reused (Huffaker & Whittlesey, 1995). In some cases, the rapid adoption of new irrigation systems has enabled High Plains irrigators to grow more water-intensive crops or to irrigate more land. Water Conservation: A Moral Principle? Some environmental philosophers have argued that efficiency and equity goals miss the fundamental point. They believe that conservation of natural resources should reflect moral duties. Such duty-based ethics reflect the writings of Immanuel Kant, who argued that all decisions should be based on moral principles. For Kantians, natural resources have their own moral standing, independent of human benefits or costs. These views suggest a policy philosophy summarized in Aldo Leopold's statement from his Sand County Almanac: "A thing is right when it tends to preserve the integrity, stability, and beauty of the biotic community. It is wrong when it tends otherwise." Such reasoning differs from mainstream economic thought because social decisions would reflect generic principles rather than the benefits and costs of particular proposals. Nevertheless, such arguments have influenced several policies; a notable example is the federal Endangered Species Act. In the extreme, moral duties have also been called upon to return the High Plains to a "buffalo commons." Of the three motives, economic efficiency has largely driven the shaping of water policies in the High Plains. During the early years of development, groundwater was considered inexhaustible and its hydrology a mystery. Water laws that fostered orderly and rapid development of the resource increased efficiency, but policies came to reflect the common pool nature of the aquifer as development grew. In the 1974 Groundwater Management District Act, Kansas lawmakers concluded that rules created by local districts were needed "for the proper management of the groundwater resources of the state; for the conservation of groundwater resources; [and] for the prevention of economic deterioration." These districts later set limits on new water permits based on the external costs to nearby water users. Sustainability motives have entered recent policy debates. The "zero depletion" proposal in Kansas would limit an area's withdrawals to the amount of natural recharge over a prescribed time period. Similarly, the "two pools" plan would restrict withdrawals only after an area's "usable pool" of water is gone; the remaining "conservation pool" would be preserved for future generations. Although the Kansas Ogallala Management Advisory Committee did not support these proposals, sustainability remained an important goal. The committee's report made several recommendations for "extending the life of the aquifer and sustaining the vitality of western Kansas" (2001, p.7-8). Flexible policy alternatives can address multiple concerns and changes in policy needs over time. Flexibility characterizes the tradable water deeds policy first proposed a quarter century ago (Smith, 1977). In this policy, each water user would receive an initial allocation of water permits that are then forfeited for each unit pumped less recharge. For instance, an irrigator initially may receive deeds for pumping 1,000 acre-feet of water from a given well. If 100 acre-feet are pumped the first year and recharge is 25 acre-feet, then deeds for 925 acre-feet remain for the next year. Irrigators could also buy and sell deeds among themselves within prescribed areas. Limiting the number of returnable permits in individual years could address efficiency goals. Similarly limiting the number of permits initially issued could address equity and moral concerns. The water deeds policy is a potential base of comparison for other High Plains proposals. One explanation for the opposition to the recent Kansas proposals is their narrow focus on sustainability. Many irrigators agree that restricting water use will enhance sustainability. Nonetheless, the two proposals did not clearly specify how the remaining water would be allocated across space or time. Absence of this provision caused considerable uncertainty about future impacts on farmers and local economies. The water deeds policy has a clear mechanism for limiting and allocating water. Deeds are not issued for the water needed for future generations, and market forces would allocate currently usable water. In effect, water deeds would create a market for the groundwater stock in the same spirit as the markets for surface water that already function in parts of the American west and other arid regions throughout the world. Beattie, B.R. (1981). Irrigated agriculture and the Great Plains: Problems and policy alternatives. Western Journal of Agricultural Economics 6, 289-299. Gisser, M. (1983). Groundwater: Focusing on the real issue. Journal of Political Economy, 91, 1001-1027. Huffaker, R.G. and Whittlesey, N.K. (1995). Agricultural water conservation legislation: Will it save water? Choices, 1995(4), 24-28. McGuire, V.L., Stanton, C.P., and Fischer, B.C. (1999). 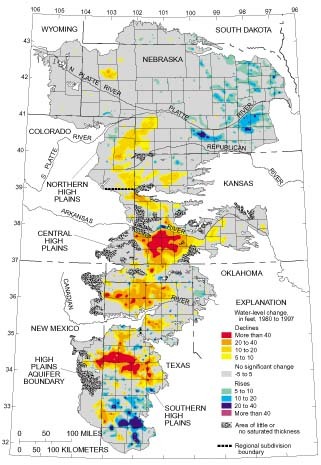 Water-level changes, 1980 to 1997, and saturated thickness, 1996-97, in the high plains aquifer (Fact Sheet FS-124-99). Washington, DC: US Geological Survey. Available on the World Wide Web: http://ne.water.usgs.gov/highplains/hp97_web_report/fs-124-99.htm. Ogallala Aquifer Management Advisory Committee. (2001). Discussion and recommendations for long-term management of the Ogallala Aquifer in Kansas. Available on the World Wide Web: http://www.kwo.org/Reports/ogallala_mac_rpt.pdf. Provencher, B. and Burt, O. (1993). The Externalities associated with the common property exploitation of groundwater. Journal of Environmental Economics and Management, 24, 139-158. Smith, V.L. (1977). Water deeds: A proposed solution to the water valuation problem. Arizona Rev., 26, 7-10. Tsur, Y. (1990). The stabilization role of groundwater when surface water supplies are uncertain: The implications for groundwater development. Water Resources Research, 26, 811-818. The Ogallala is the largest freshwater aquifer in the world. 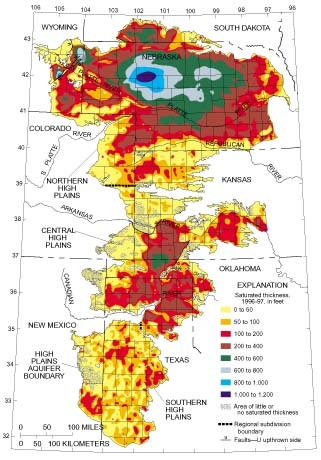 The maps above show the saturated thickness (vertical distance between the water table and the aquifer floor) of the Ogallala in 1996-97 and the water level changes between 1980 and 1997. The aquifer is depleted in parts of northern Texas and west central Kansas. A large share of Ogallala water lies beneath the Nebraska Sandhills, where the resource remains largely untapped because crop irrigation is uneconomic. Early High Plains settlers were plagued by cycles of drought, culminating in the disastrous Dust Bowl of the 1930s. The stock cost is the loss in water to future users for each unit pumped by a current irrigator. The depletion cost is increase in irrigation costs, due to higher pumping lifts and lower well capacities, as one irrigator lowers the water table by pumping. The risk cost occurs because groundwater is used as a buffer against the large variability in rainfall, allowing irrigators to limit their exposure to production risk. If pumping becomes more expensive because other users have lowered the water table, increases in the implicit premium for this insurance expose an irrigator to more risk. Common pool resources, including groundwater, are likely to be overused if left unregulated. Jeffrey M. Peterson (jpeters@ksu.edu) and Thomas L. Marsh are assistant professors and Jeffrey R. Williams is a professor in the Department of Agricultural Economics at Kansas State University.